Next time you go out for sushi in Los Angeles, don't bother ordering halibut. Chances are it's not halibut at all. "Half of what we're buying isn't what we think it is," said Paul Barber, a UCLA professor of ecology and evolutionary biology and senior author of the study that appeared today in the journal Conservation Biology. "Fish fraud could be accidental, but I suspect that in some cases the mislabeling is very much intentional, though it's hard to know where in the supply chain it begins. I suspected we would find some mislabeling, but I didn't think it would be as high as we found in some species." It's not just a question of being miffed that the wrong fish is on your plate—the fraud undermines environmental regulations limiting overfishing, introduces unexpected health risks and interferes with consumers' decisions, the researchers noted. Over the four-year study, only bluefin tuna was always exactly as advertised. While only one of 48 tuna samples was not tuna, different kinds of tuna occasionally swapped places, including two samples that turned out to be Atlantic bluefin tuna and southern bluefin tuna, species classified as endangered and critically endangered. Out of nine orders of yellowfin tuna, seven were a different kind of tuna, usually bigeye—a vulnerable and overexploited species, the researchers said. Salmon remained a largely safe bet, with only 6 of 47 orders going awry. However, all halibut and red snapper orders failed the DNA test, and in 9 out of 10 cases, diners ordering halibut were served flounder. About 4 in 10 halibut orders were species of flounder considered overfished or near threatened. Although some short-term studies have suggested that fish fraud is declining due in part to stricter regulations, this study uncovered consistent mislabeling year over year, indicating seafood misidentification is not improving. While the current study took place in Los Angeles, previous studies detected similar problems nationwide, suggesting that the UCLA findings are widely applicable, said Barber, who worked with co-lead authors Demian Willette and Sara Simmonds, and researchers from UC Santa Cruz and UC Santa Barbara. Willette is a UCLA assistant research scientist and a Loyola Marymount University biology instructor, and Simmonds was a UCLA graduate student when the research began. "If we don't have accurate information on what we're buying, we can't make informed choices," Barber said. "The amount of mislabeling is so high and consistent, one has to think that even the restaurants are being duped." For consumers trying to avoid threatened or overfished species, sushi fraud can thwart their efforts. For diners—especially pregnant women or small children—who wish to avoid high-mercury fish, mislabeling could harm their health. And some fish are riskier than others: a common parasite found in raw olive flounder, which replaced halibut on researchers' plates a third of the time, has caused "rampant" food poisoning in Japan, the study noted. "DNA barcoding is becoming an increasingly popular tool to identify mislabeled products," said Willette. "Our finding of a persistently high rate of seafood mislabeling should encourage consumers to demand strong truth-in-menu laws from local public health agencies. Citizen-science and crowd-sourced data also have real potential to keep the consumer informed." "As a foodie mecca, Los Angeles wields enormous influence," Sikich said. "Fish fraud at L.A.-area restaurants and grocery stores can pose health threats if substitute fish are contaminated or contain allergens, thwart consumers who are trying to buy sustainable, and impede fisheries policy. This study points to the importance of measures to improve traceability and monitoring to reduce the prevalence of fish fraud." 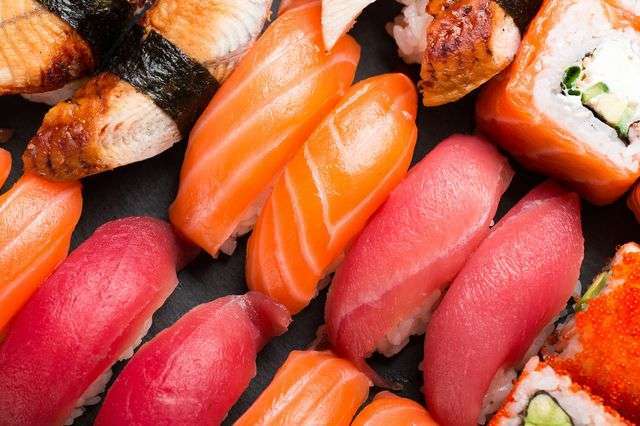 From 2012–2015, the UCLA researchers tested 364 samples of 10 popular varieties of fish used for sushi. Extending the project for four years was possible in part because it involved students from the UCLA class Introduction to Marine Science, in which Willette was an adjunct faculty member and Simmonds was a teaching assistant. The students were sent to sushi restaurants popular on the reviewing site Yelp to order specific types of fish from the menus. When their orders arrived at their tables, they asked the servers to confirm each fish type. Then they pulled out their forceps and scissors, snipped off a tiny piece off each kind of fish, and dropped it into prepared vials for DNA testing as part of the lab requirement for their class. "It's a very powerful teaching tool for them to collect this data themselves," Barber said. "From an educational perspective, that has a massive impact. These students will never forget what they learned." "The goal is not to point fingers, but to make people aware of the larger issue," Barber said "I think it would be really cool to work with some restaurants to test their shipments so we can start to work out where in the supply chain the fraud is taking place. I would love to know what the restaurants think they're getting from the suppliers."